Interdependence: When organisms in an area depend on each other for food. All organisms require food to survive. Some organisms are producers and make their own food, such as green plants, and the rest get their food from other organisms. They are either primary consumers (by eating plants) or secondary consumers (by eating primary consumers). Food chains show what eats what. Organisms that feed on the same level in a food chain are in the same trophic level. Food chains from a habitat can be joined together into a food web which shows the feeding relationship between the different organisms. You can see from this food web that organisms in an area depend on each other for food; they are interdependent. As the numbers of one organism change, other organisms are affected so the relationships among the organisms are always changing. We call this a dynamic relationship; dynamic means changing. The Sun is the source of energy for nearly all life on Earth. Plants convert a small percentage of light that falls on them into glucose. A rabbit, for example, may eat the plant and use up some of the energy it gets from the plant. The rest of it is stored in its body. Then a fox may eat the rabbit and therefore get some of energy stored in rabbit’s body. This is a simple food chain. Energy is used up at each stage to stay alive in numerous ways. For example, respiration uses up energy, heat energy is lost to surroundings and energy is lost through excrement. Heat energy lost is especially true for homeotherms whose bodies must be kept at a constant temperature which is normally higher than their surroundings. The energy isn’t really ‘lost’ – it just means the next animal in the food chain can’t use it. This explains why it is very rare to get food chains with more than five trophic levels. So much energy is lost at each stage that there simply isn’t enough energy to support more organisms after four or five stages. Biomass is how much the creatures at each level of a food chain would weigh if you put them together. 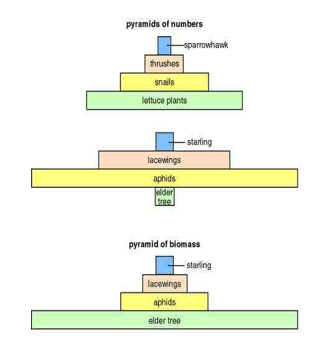 This biomass is a store of energy – so a pyramid of biomass shows how much energy there is at each stage in the food chain. In this pyramid of biomass, the elder tree is at the bottom. There may be very few of them but if you weighed them all together it ends up being the largest trophic level. Each time you go up one trophic level the mass of organisms goes down. This is because most of the biomass/energy is lost and so does not become part of the biomass in the next level up. Parasitism: This is when organisms live on a host organism but the host organism is harmed and the organism on the host benefits. Win-lose situation. Mutualism: This is when both organisms benefit and rely on each other for survival. Win-win situation. Fleas: Fleas are insects that live in the fur and bedding of animals, including humans. They feed by sucking the blood of their hosts and can reproduce quickly. Their hosts gain nothing from having fleas. Head lice: these are insects that live on human scalps, sucking blood for food. Tapeworms: Tapeworms attach themselves to the intestinal wall of their hosts. They absorb lots of nutrients from the host, causing them to suffer from malnutrition. Mistletoe: Mistletoe is a parasitic plant that grows on trees and shrubs. It absorbs water and nutrients from its host, which can reduce the host’s growth. Oxpeckers: Oxpeckers are birds that live on the backs of buffalo. They eat the pests of the buffalo such as ticks, flies and maggots which benefits the oxpeckers as they get a source of food and the buffalo is free of pests. Not only this, but they also alert the animal to any predators that are near, by hissing. Oxpeckers are an example of a cleaner species. Cleaner fish: Another example of cleaner species is cleaner fish, such as cleaner wrasses. They eat dead skin and parasites off larger fish, such as groupers. In return they get a source of food and avoid being eaten by the big fish. Nitrogen-fixing bacteria in legumes: Most plants have to rely on nitrogen-fixing bacteria in the soil to get the nitrates they need. But leguminous plants (beans, peas, clover etc.) carry the bacteria in nodules in their roots. The bacteria receive a constant supply of sugar from the plant and the plant gets essential nitrates from the bacteria. Chemosynthetic bacteria in deep-sea vents: Some chemosynthetic bacteria live inside giant tube worms or in the gills of molluscs in deep sea vents. The tube worms supply the bacteria with chemicals from the seawater which the bacteria turn into food for themselves and the host worms.